Wow, its been a month since my last update- apologies to anyone thats been looking for an update- things have been very busy at home and whilst I've had a lot of time painting I've barely been on the computer at all. 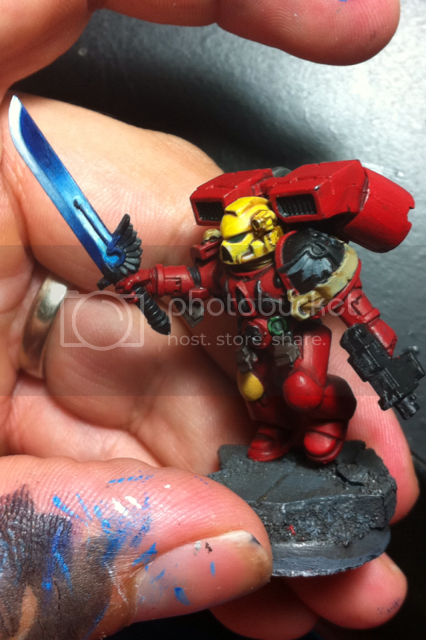 With only 17 days left before Cancon i'm in overdrive trying to get the Blood Angels up to a certain level of completion. I've resigned myself to the fact that they wont 100% done- they'll most likely still have unfinished bolt pistols and chainswords, and some chest and shoulderpad details wont be completed. 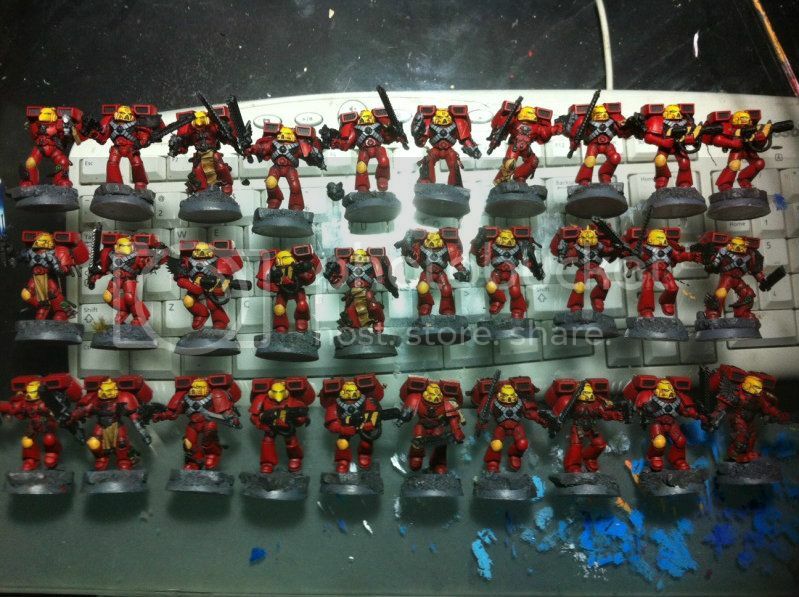 However, I should quite happily get all the red armour plating painted and basically highlighted. I have finished the helmets on all the Assault Marines, included their eyes- I will go back and re-line a few bits later, but they will suffice. Terminators will get some love really son, and the Attack Bikes after that. Wont be winning any awards with them in this state, but I'll have them all completed and detailed in time for Wintercon (June) without too much hassle. The Stormraven is getting moved along quite well- all the 90 degree edges and gaps between panels have been shaded with several coats of Carroburg Crimson, and i've started on highlights on the sharpest edges, the whole vehicle is really starting to 'pop'. 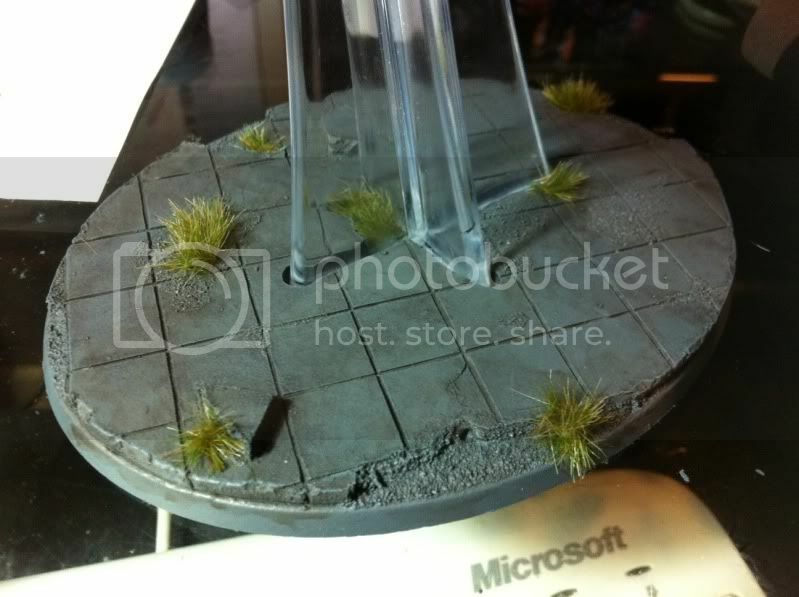 I also built an overlay to go on the Raven's base, which is made from MDF and has been carved with a dremel and small cutting wheel to look like ruins just like the rest of the army's resin bases, it looks fairly convincing. I decided that my Assault Sergeants should stand out a bit, and to this end I've swapped out the one guy with a Power Axe to have a Power Sword instead. I've then painted up a scheme on all three swords that is a stylised reflective look, going from deep dark blue up to white, through 6 colours and thinning the paint as much as possible. It can take a fair bit to get right, and a lot of time is spent going back and fixing up the transitions to make them as smooth as possible. On a gaming note, I've been doing some research concerning what Psychic discipline to roll for with my 2x Librarians- we roll for this before our first game and our opponent signs off on it, and this is what they use for the whole tournament. I was originally using Biomancy, for the potent offensive capabilities it gave, however I now believe that Divination to be the best for a Librarian, who should be used to buff an attached unit. Even if you roll for things you dont want you can fall back to the primaris power of Prescience, which provides for re-rolls to hit (shooting and cc) which really helps boost the power of an assault unit. Moreso than any other discipline these ones will keep your men alive and killing better for longer. I'm also thinking that my Librarian in Terminator Armour will only selectively answer or issue challenges, as his axe-wielding capabilities are massively overshadowed by the 5 Thunder Hammers in the squad he's attached to- in addition he's going to be my Warlord, and will therefore have a 1VP price on his head, which I dont wish to squander. So, he'll skulk at the back of the pack for most engagements, unless circumstances are in his favour. Still working out how best to use the Terminators, I'm even thinking that I could Deep-strike them in on turn two in the vicinity of the Furioso's Drop Pod, to form a ridiculously resilient CC strongpoint. 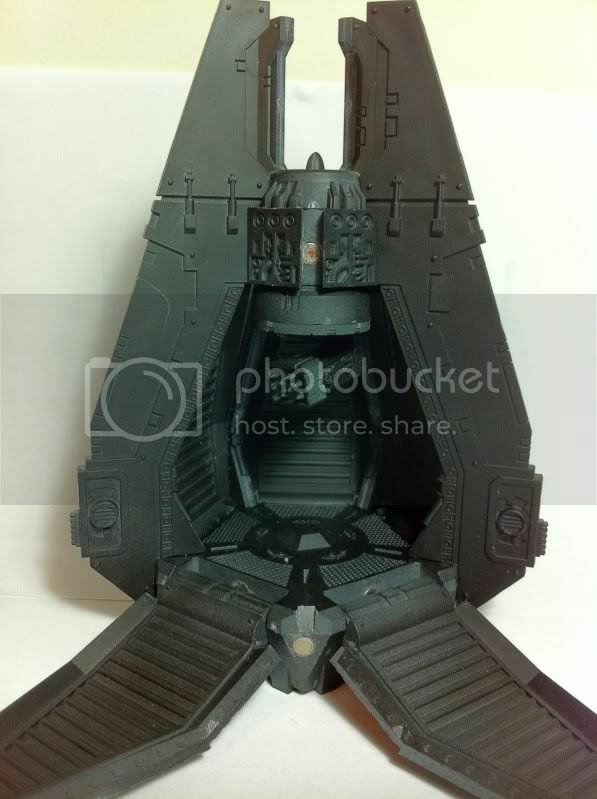 Speaking of, here's the modified drop pod for my Furioso. Didnt want to splash out for the FW Dread Pod, so I've modified this standard troop carrying one to have a removable fin section (fluff wise- explosive bolts blow it out on landing when the doors drop) and Adiel comes lumbering out. 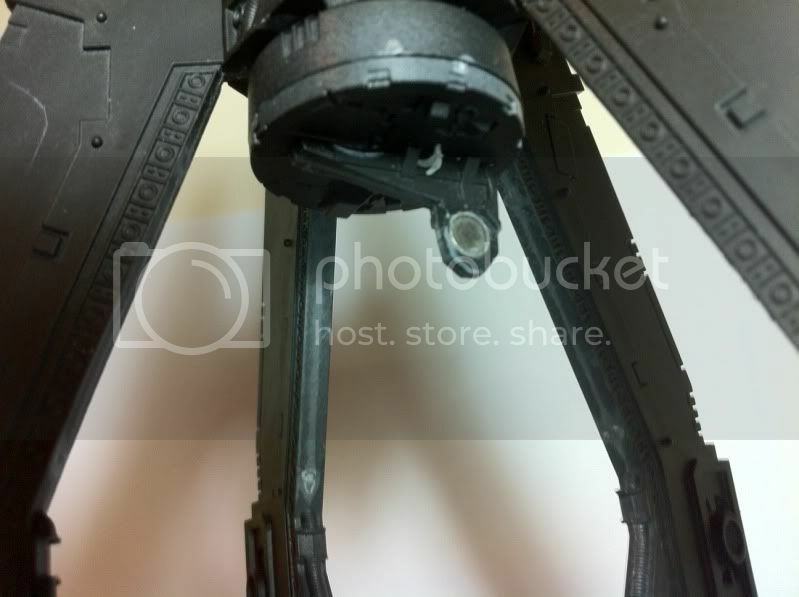 I also magnetised the gun mount in the roof to allow me to still use the stormbolter or missile pod, and they can still articulate up and down. 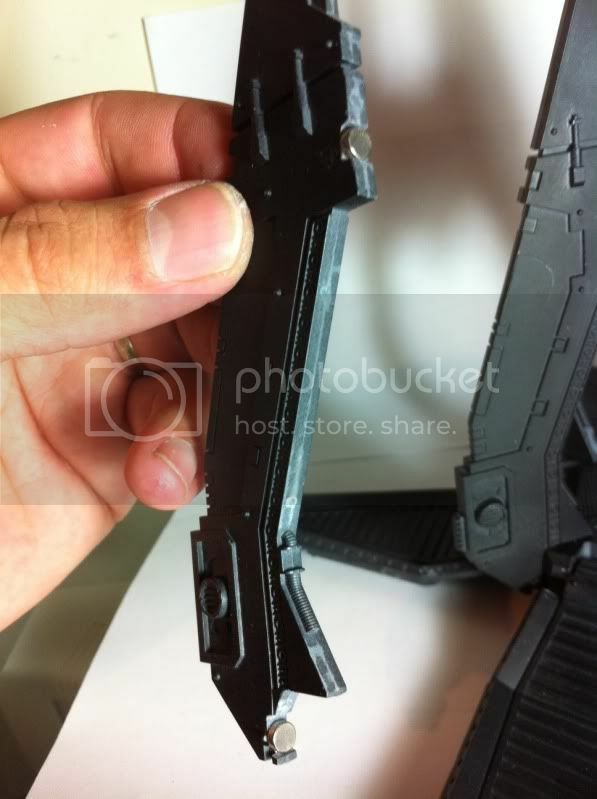 If one takes the liberty of assuming that the gun and its mount retract into the roof of the pod then the Dreadnought fits in quite easily!! This conversion turned out better than I expected. Magnets are mounted top and bottom for maximum hold. lots of care to make this fit without blowing out the sides. Recessed magnets with lightly filed-down outer edges. Snaps into place really solid. Thats enough for today- got loads more work to do! 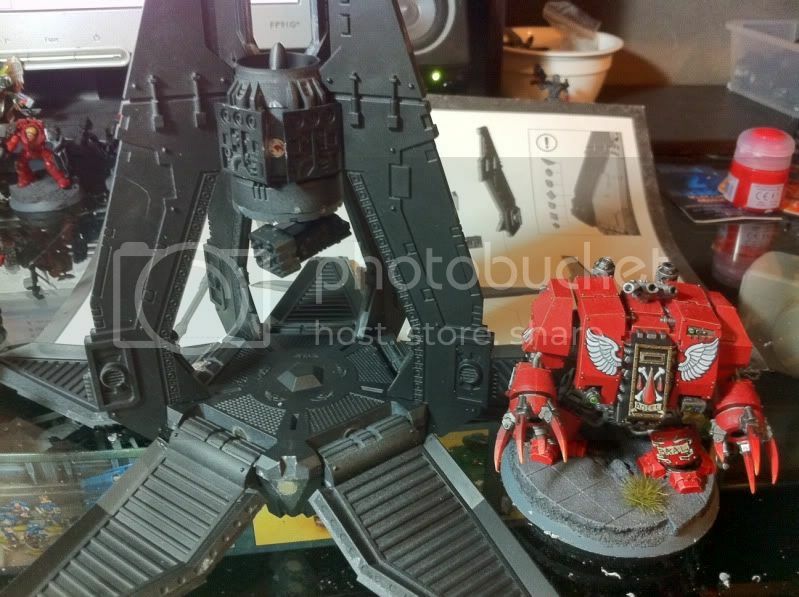 Cool mod-work on the Dreadnought Drop Pod. What size Magnets dd you use? Magnets are 5mm x 2mm discs from memory. Would have used the square/rectangle ones but my local hobby store didnt have any at the time.